GoFundMe spokeswoman Katherine Cichy told RealClearInvestigations that Ford and her husband can withdraw as much as they want whenever they want for any purpose. Payments would be electronically deposited into the Fords' bank account within two to five business days of initiating withdrawals. All told, more than 21,000 people have donated to her cause. Several donors have written big checks, including Grateful Dead bassist Phil Lesh, who gave $10,000. Lawyers Debra Katz and Michael Bromwich flank Christine Blasey Ford at the Kavanaugh hearings. 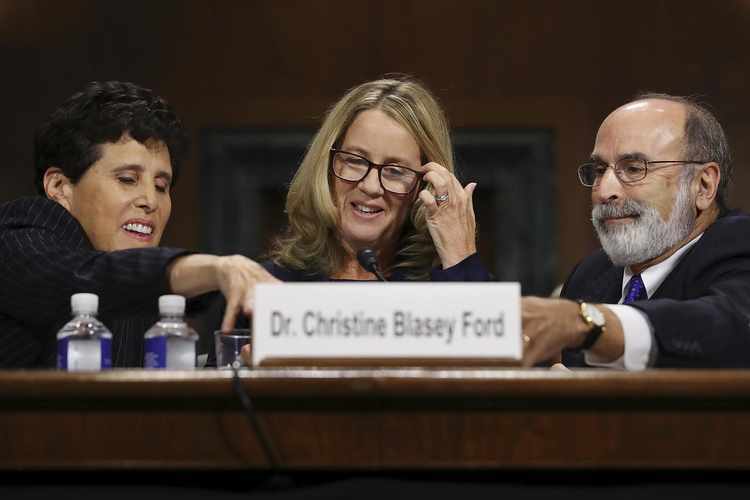 Some question the necessity of the financial assistance given that much of the costs associated with Ford's testimony – including all of her legal fees plus a polygraph examination – were covered by Democratic attorneys assigned to her by the Democratic members of the Senate Judiciary Committee, committee sources say; panel Democrats were allotted half of a $1 million committee fund for transportation, security, investigations and other expenses associated with the tumultuous confirmation process. The Senate Sergeant at Arms and Capitol Police also provided "heightened security" for Ford. "Her lawyers said they were representing her on a pro-bono basis. Why does she need all of this money?” said an attorney familiar with the committee's investigation into her allegations, adding that the funds were originally set up to help pay her legal bills. Attempts to reach Ford at her home and office were unsuccessful. In a dramatic September hearing, the Palo Alto University professor accused Kavanaugh of sexually assaulting her when the two were in high school. Following her tearful testimony – and an angry denial from Kavanaugh – the GOP-led committee agreed to ask the FBI to investigate her charges. After agents could not corroborate her story, the full Senate voted to seat the judge on the high bench earlier this month. 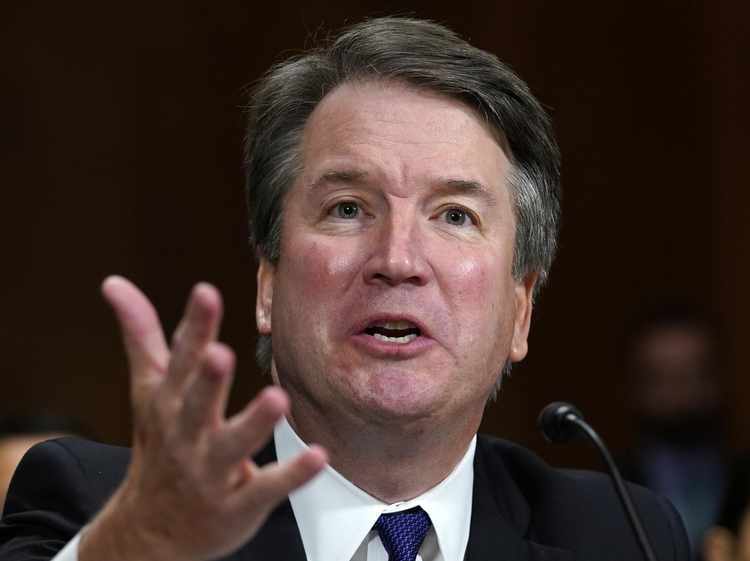 RealClearInvestigations reached out to Ford’s legal team – including Washington attorneys Debra S. Katz, Lisa J. Banks and Michael R. Bromwich – to determine the scope of their financial assistance. Asked specifically if any of them helped cover her travel or security costs, in addition to her legal bills, the lawyers declined comment. Brett Kavanaugh during his testimony in September. The most detailed threat reported, which a friend of Ford’s relayed to the New York Times, concerned a social media message Ford allegedly received that said, “From what I’ve heard, you have 6 months to live, you disgusting slime." Ford’s lawyers said she has met with the FBI at its San Francisco field office to discuss the threats, which Ford testified were “terrifying and have rocked me to my core.” It’s not immediately known if any arrests were made, or if the threats were ever determined to be credible. The FBI did not respond to requests for information. She and her lawyers also claimed she was forced to flee her home due to threats. Journalists may have also factored into Ford's relocation. After she first told her story in the Washington Post, the national media staked out her Palo Alto home for several days, peering into her windows and trampling her front yard. Ford testified that members of the media also stalked her at her workplace. 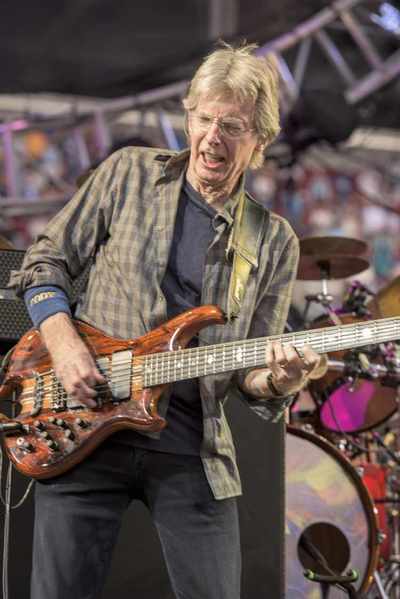 Grateful: The Dead's bassist, Phil Lesh, donated $10,000. Local media reported that demonstrators also gathered around her home, almost all of whom were sympathetic neighbors, friends and other supporters, not protesters. Dozens of supporters last month lined her street and interlinked arms to form a human wall in front of her house to “protect Christine.” A few days later another 2,000 people turned out for a candlelight vigil to support Ford in her largely liberal neighborhood. Earlier this month, Ford appealed to GoFundMe donors to continue contributing to her coffers, portraying a family on the run and under increasing threat: "We have already had to move four times, our movements are limited even with security, and the threats are ongoing.” She said she needed the donations to defray the “costs for housing,” in addition to transportation and security. But congressional sources say that, while Ford and her husband and two sons left their home, their temporary housing costs have been nominal. They point out that they have stayed with relatives or at their beach house in Santa Cruz, Calif. The Fords bought the beach home along with their Palo Alto home in 2007, after selling a historic bed and breakfast for more than $1.5 million. The Victorian-style B&B located near La Selva Beach, Calif., featured seven bedrooms, 6.5 bathrooms and tennis courts on 1.3 acres, and also served as their private residence. Real estate records show the Fords have mortgages on both their current homes. They also spent tens of thousands of dollars refurbishing the B&B and renovating their Palo Alto house, including adding a room with a second front door to rent out to tenants (Ford testified she added the door due to “claustrophobia” and other residual anxiety from the alleged Kavanaugh assault). Local records show that Christine Blasey Ford recently applied for a building permit to remodel their Santa Cruz beach house. The application was made on July 16 – just two weeks before she sent her letter accusing Kavanaugh of assaulting her to Sen. Dianne Feinstein, the top Democrat on the Judiciary Committee. The proposed remodeling job is significant and expensive. The application obtained by RCI includes an almost 500-square-foot addition, along with a new front porch and new decks. Ford’s defenders said it is absurd to suggest that she was aiming to cash in on such a traumatic chapter in her life. “The idea that she would risk her safety and the safety of her husband and children for some free money is pernicious, the sort of toxic absurdity that spreads among folks who view women, in general, with suspicion,” Chicago Tribune writer Heidi Stevens opined in a recent column. Heidi Li Feldman, a Washington law professor who started one of the GoFundMe campaigns for Ford, speculated that the Ford family could be spending as much as $10,000 a week on security, which would put her total costs at roughly $55,000 so far (assuming she continued to hire bodyguards after she testified Sept. 27 and after Kavanaugh was sworn in as associate Supreme Court justice Oct. 6). “I sponsored a capped fundraiser to assist Dr. Blasey with her security expenses,” said Feldman, who has raised a total of more than $241,000 for Ford. But the Fords' multimillion-dollar real estate assets raise questions about their burden and need for crowdfunding. Both Ford and her husband hold well-compensated jobs in academia and biotech. Aside from possible financial incentives, critics say Ford clearly had a political motive to come forward with her unsubstantiated charges against Kavanaugh. They note that she is a registered Democrat who has made contributions earmarked for Bernie Sanders, the Democratic National Committee and the Democratic Congressional Campaign Committee. She also marched against Trump’s stance on climate change and signed a letter speaking out against the Republican president's immigration policies. Trump nominated the conservative Kavanaugh last summer. Her university also engages in liberal activism. PAU lists its core mission as “Social Justice” and offers a degree in “social action." Some legal analysts worry her crowdfunding windfall sets a dangerous precedent by creating a new incentive for accusers. They fear partisan activists will now offer crowdfunding as a form of bounty on political foes, or to buy witness testimony against political adversaries. 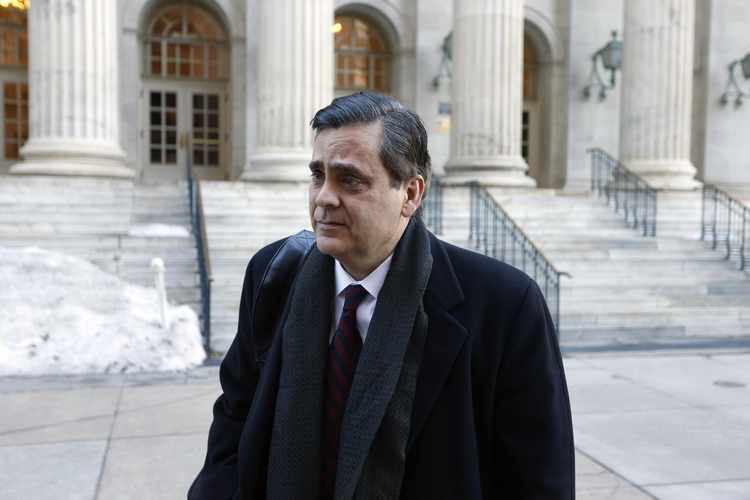 Jonathan Turley: With the promise of GoFundMe money, "you could buy a witness, effectively." Turley said that asking if the prospect of making money influenced Ford “to take a certain approach in [her] testimony,” and inquiring how the money raised for her will be spent, are both legitimate questions. He recommended that crowdfunding sites not only audit how such politically tied money is spent, but that they set up ethics “standards" to guard against fraud and abuse in such cases. GoFundMe’s Cichy declined to respond to questions about these concerns. Feldman, the lawyer who raised funds for Ford, also supported Hillary Clinton’s 2016 candidacy, donating thousands of dollars to her campaign. After Donald Trump won the election, she organized the national boycott of retailers selling Trump brands. The GoFundMe campaigns are only part of the financial assistance she is receiving. Asked during her testimony if anyone else besides her lawyers and crowd-funders are helping finance her efforts, Ford answered that “there are members of the community in Palo Alto that have means to contribute to help me with the security detail, etc.” She did not elaborate.